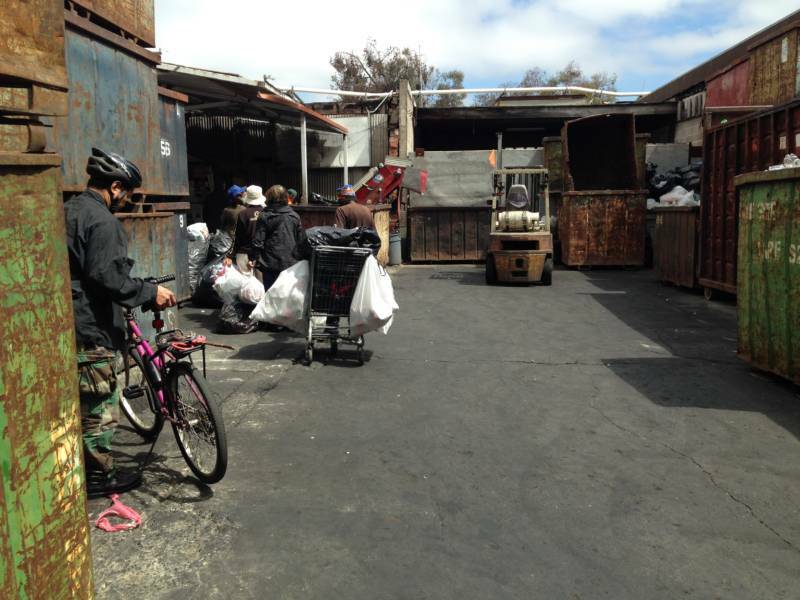 Advocates say they've raised tens of thousands of dollars to help slow the closure of a West Oakland recycling center featured in the 2015 documentary "Dogtown Redemption." Alliance Recycling has operated in Oakland's Dogtown neighborhood for decades, serving hundreds of low-income clients who make money from recycling. In 2015, the Oakland City Attorney's Office fined Alliance about $17,000 for more than 40 alleged violations based on neighbor complaints. The violations included blocking the roadway and leaving trash in the streets. As a result, the new owners who bought Alliance in 2014 and changed the name to Glass King (though it's still widely known as Alliance), agreed to close the facility on Aug. 20. But advocates now say they want a chance, and more time, to find a "compassionate" solution. Since the release of "Dogtown Redemption," co-director Amir Soltani has written extensively about the injustice of closing Alliance, which he says unfairly paints the hundreds of walk-up patrons as criminals. Soltani takes issue with this stance and has created an online petition, which now has more than 1,700 signatures, pleading with city officials to "protect the economic livelihood of the clients, employees and owners of Alliance recycling." Most recently, Soltani has helped raise $70,000 that could potentially keep Alliance open temporarily while helping the neighborhood and recyclers transition through the closing. Landon Goodwin, a former minister, found himself living on the streets of West Oakland and relying on income made from recycling. A couple of other recycling centers exist in West Oakland, but none offer the kinds of walk-up services that benefit many Alliance clients. Alliance's current owner Lance Finkel is among those who say closing the recycling center will be disastrous and could actually lead to more crime in the neighborhood, not less. Officials from City Council President Lynette Gibson McElhaney's office met with West Oakland neighbors Monday night to discuss how to serve the recyclers and community moving forward. In a written statement through a spokeswoman, Gibson McElhaney said, “We have deep concern and compassion for the recycling center's clients and workers and have been meeting with advocates and community members to identify ways that we can help minimize the impact of the closure. While we were not a party to the settlement between Glass King and the City of Oakland, my staff continues to explore more sustainable income-generating work and partnerships to connect the center’s users with needed social services as well." Ray Kidd, with West Oakland Neighbors, says the group discussed an outreach event tentatively scheduled for Aug. 27 at the park across the street from Alliance. The event would offer services and referrals to some Alliance clients to help them find other work, he says. Any future agreements made with neighbors would likely not include keeping Alliance open permanently in its current location on Peralta Street, Soltani says. Certain neighbors have been clear with the city that they do not want the center operating where it's at, he says. Finkel has his eye on a couple of properties in West Oakland he would like to relocate his recycling center to, but "at this point the city doesn't want to work with us," he says. Over the years, the city added several conditions to Alliance's conditional use permit to address public nuisance issues, a city spokesman says. Attorney Rena Rickles, who represented Alliance, says many of the allegations against the recycling center would have failed in an administrative hearing, but the cost to challenge would have been too high. Plus, the city made it clear the allegations would likely not stop, she says. “We would have been subject to unrelenting allegations, appeals, hearings, a la Groundhog Day." Rickles says. The plan for how to spend the money Soltani has helped raise is still being developed and discussed. But he says he knows time is running out, and it won't be the city who needs to be won over first. "I think the city will OK it if the neighbors come along," he says.